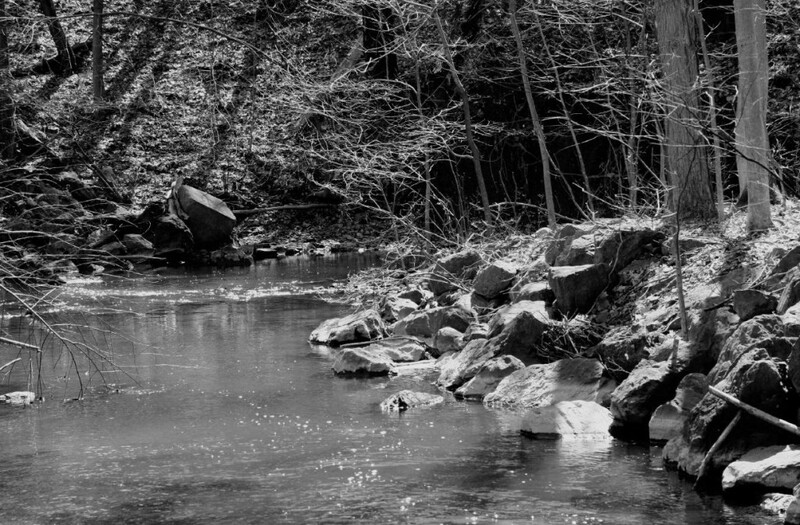 An Environmental Research Institute-sponsored team of faculty and students from the departments of Chemistry, Biology, Earth Science and Geography, and Urban Studies has established a long-term research study (the Casperkill Assessment Project, or CAP) on the health of the Casperkill Creek and its watershed. The Casperkill is the stream that runs through the Vassar campus and is dammed to form Sunset Lake. It begins in a small wetland about 2 miles north of campus and flows southwestward, joining the Hudson River near the Poughkeepsie Galleria mall. On its journey, the Casperkill flows past landfills, shopping centers, and a Department of Transportation salt storage shed before traversing the Vassar campus, Vassar farm/ecological preserve, and residential neighborhoods. Many of these land uses cause pollution in the stream, as does an underfit sewer line that frequently overflows raw sewage during heavy rains. Since the spring of 2006, student and faculty researchers have conducted water quality monitoring on a monthly basis, assessing such parameters as the amount of road salt in the stream; dissolved oxygen, nutrient, bacteria, and heavy metal levels; stream water pH; the extent and species composition of streamside vegetation; and the state of aquatic organisms. The goal of the project has been to determine what the overall health of the stream is, to identify sources of pollution, and to work with local residents and government officials to improve water quality. An additional goal has been to foster interdisciplinary research among the faculty and to provide students interested in Environmental Studies with research training. Funding for equipment, reagents, and student summer stipends has come from the URSI program, ERI funds, a New York Water Resources Institute grant, and a Major Research Instrumentation grant from the National Science Foundation.